Oh hi friends! Long time now see. It was a crazy crazy Summer on the farm, hence the lack of blogging. But there was not a lack of baking....so we're going to play catch-up for a while! 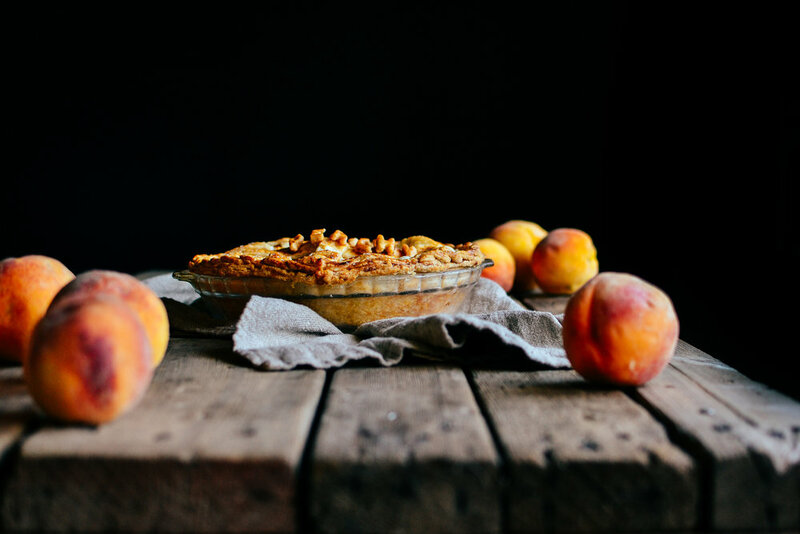 Starting with this AWARD-WINNING PEACH PIE. So. A local farm market (Lepp Farm Market...for you Fraser Valley locals!) had a peach pie contest in late August....and I thought to myself "hmm....I should maybe enter that!". So I did. And there were SO MANY PIES!!! 19 to be exact. Those "poor" judges who had to taste them all...Ha! Anyway, I made a peach pie for the first time, added some freshly grated ginger, and won 2nd place. Yahoo! So so excited...hence the cheeky title of this post. I cannot get over the perfect combo of ginger peach. The fresh ginger complements the peach so well, and gives it such a unique flavour. If you have a few leftover peaches kicking around your fridge, please make this asap. Prepare your pie crust, either a pre-bought situation (no judgement), or a homemade. Roll out the bottom into your pie dish and place in the fridge to cool. In a large bowl, combine your sliced peaches with the lemon juice right away (to keep from browning), and the vanilla. In a medium bowl, mix together flour, tapioca, brown sugar, white sugar, and ginger. Add flour mixture to peaches, and gently stir. Scoop into pie dish and return it to the fridge. Roll out top crust and choose your design. I cut strips for a lattice design, and used mini cookie cutters to write "Just Peachy" on the top! I recommend baking your letters separately on a small pan, and doing multiples of each letter. I stuck mine to the pie using a bit of peach juice from the pie and pressing onto the pie once it was finished baking. Brush the top of the crust with a beaten egg, and sprinkle with coarse sugar. Bake for 15 minutes at 400 degrees F, and then reduce temperature to 375 degrees F and bake for 30-40 minutes, until pie is bubbling well. Allow to cool for about an hour before serving. Best served warm the day it was made! *Pro tip: for peeling peaches, place them into a large pot of boiling water for about 10 seconds, then remove and place into an ice bath. The skin will then just rub off soooooo easily. This pie was so loved by my family and friends that I made it twice in one week....ha! Hope you enjoy it as well.